This month we feature a dazzling aquamarine. 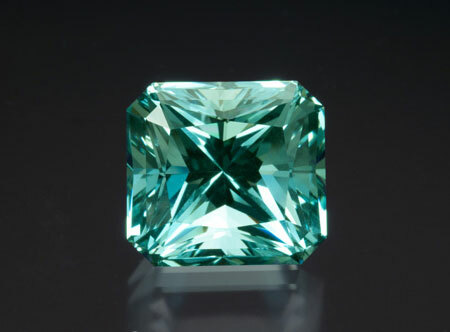 In the gem trade aquamarine most often refers to the blue variety of beryl, but the first element of this compound word actually implies some green. Even Webster’s Dictionary defines aqua as “a light greenish blue color.” Today most pure-blue aquamarines are heated from greenish blue rough; the heated process removes the secondary green hue and leaves only the blue hue. Our featured aquamarine exhibits the beautiful blend of blue and green in its natural state. It’s reminiscent of open ocean water, which is of course implied by the second element of the word: marine. 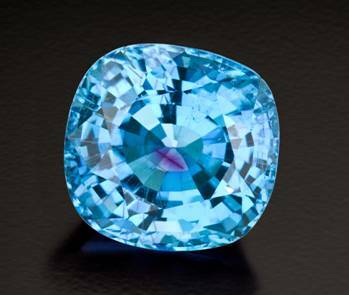 Major producers of gem-quality aquamarine today are Brazil, China, and several countries in Africa. Bill Larson is slated to speak at this year’s seventh annual John Sinkankas Symposium, on the event’s sole topic: spinels. The symposium is sponsored by the San Diego Mineral and Gem Society and the Gemological Institute of America (details here). 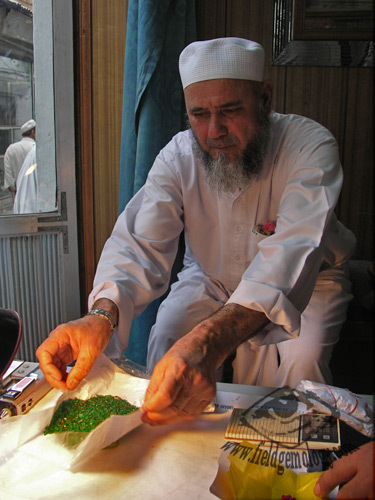 Bill’s extensive knowledge on spinels, from mine to market, will guide you through the five major spinel producing regions: from the historic deposits in the Pamir mountains of Tajikistan, to the diverse deposits around Burma, to the alluvial deposits of Sri Lanka, to the Luc Yen region of Vietnam, and finally the recent major find near Mahenge in Tanzania. In discussing these varied deposits Bill will incorporate geography, geology, mineralogy, and gemology. The talk will be accompanied by some current and colorful images of mining localities, rough crystals, faceted gems, and inclusions. 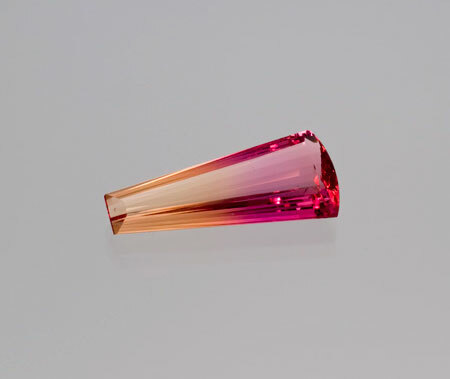 As the International Colored Gemstone Association’s cover of last summer’s InColor states, “Like a phoenix—red spinel on the rise,” Bill will bring us all the history behind this very trendy and desired gemstone. 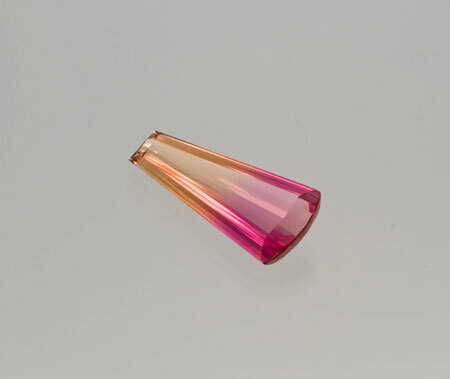 A new study by Dr. Mary L. Johnson examines the life of a tourmaline crystal in three stages to reveal the natural origin of the pink color around growth tubes, which we see in some of today’s faceted tourmaline from Mozambique. 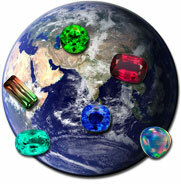 The study was distributed by the American Gem Trade Association, March 25. 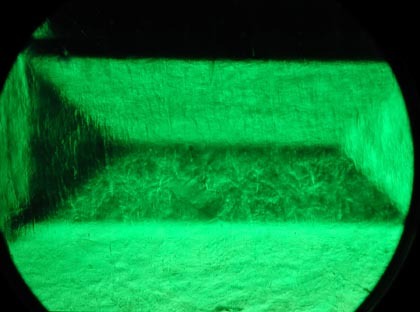 In the initial stages of crystallization in a pegmatitic environment, the crystal grows from bottom to top and inside out. 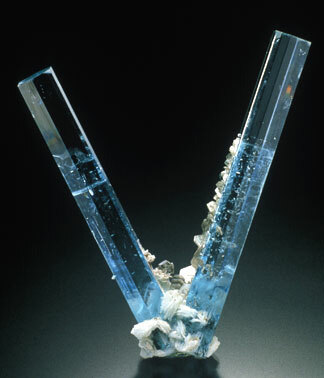 Varying amounts of trace elements, precipitated minerals, and phase-splits into liquid and gas, are a few of the events that can morph the character of the crystal. These external changes can cause internal changes in the form of color zoning, cracks and healed cracks or fingerprints, and incomplete growth along the C-axis causing long fibrous tubes or trichites. The second stage involves the weathering, eroding, and ultimate etching of tourmaline crystals into worn pebbles and nodules. Then the cavities and hollow tubes are penetrated by the local soil and earth. 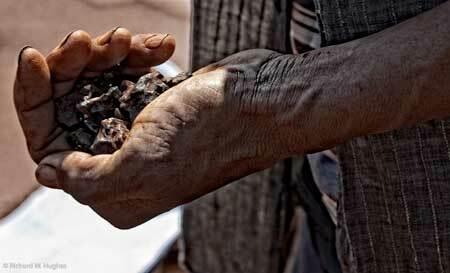 The lateritic soils surrounding the tourmalines in Mozambique are rich in iron oxides, clay, and tiny quartz crystals. When these soils contain radioactive components and there is presence of manganese in the tourmaline crystal, pink halos can form around the hollow tubes. The final stage is where Man comes in…collecting the worn and penetrated pebbles, cutting and polishing, and then the final heat treatment. Heat treatment will cause the imbedded soils to turn into a brick-like material—most likely the cause of the brick colored needles in the photo above. GIA’s Spring 2009 edition of Gems & Gemology contains an article entitled “Solution-Generated Pink Color Surrounding Growth Tubes and Cracks in Blue to Blue-Green Copper-Bearing Tourmalines from Mozambique,” which deduces some very relevant findings on this issue as well. 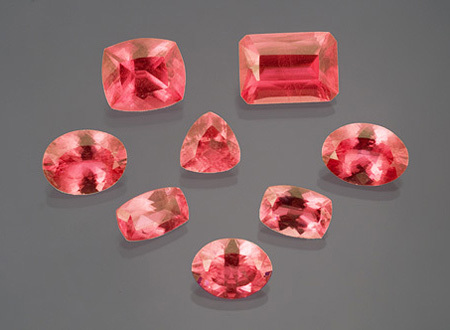 Radiation has been historically and scientifically proven to produce pink-to-red discoloration in tourmaline. Pink coloration, or pink sleeves around the tubes, were only seen around growth tubes and cracks that reached the surface of the host gem. In structures that were completely confined within the host gem, no pink colorations were present. These pink structures may be diagnostic to the Mozambique deposit. 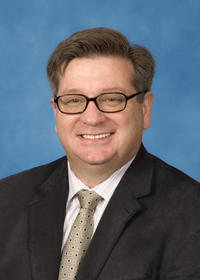 American Gemological Laboratories (AGL), which had its closure announced March 2 by its parent company, Collectors Universe, will be reopening under the leadership of Christopher P. Smith, former VP and Chief Gemologist for AGL. Collectors Universe (NASDAQ: CLCT) blamed the “severity of the economic recession and the worsening of the credit crisis” in the U.S. The company’s other collectibles grading businesses are “fundamentally healthy,” according to the announcement. A December 31, 2008 release reported that jewelry grading posted a Q2 2008 loss of $10.8 million, down 25 percent. Two weeks later, the company announced the departure of its CEO, Michael Haynes, effective April 1. Smith’s team will remain the same after he purchases the lab, its name, and its assets. 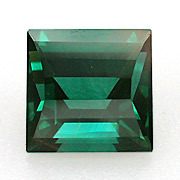 (Smith is a past director of the Gübelin Gem Lab.) The lab’s exiting president, Casper R. “Cap” Beesley, issued a statement April 1 that: 1) he is severing his ties with AGL, and 2) he’s not retiring. The bargain hunters sniffed at the catalog-cover lot, a 28-carat heart-shaped diamond and seed pearl necklace by James de Givenchy for Taffin, estimated at $2.8–$3.4 million. Also passed over was a 12-carat purplish pink diamond ring with a $2.1–$2.7 estimate. Much jade went, including a lovely “peapod” pendant and (separately) earrings, both of which met their estimates, fetching $360,000 and $250,000, respectively. 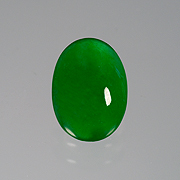 But several high-value jadeite lots failed to sell. For many Americans, Pakistan took center stage during the U.S. Presidential campaign, with then-candidate Barack Obama’s threat to unilaterally invade the country given the right circumstances. These threats weren’t idle: unmanned drone aircraft, controlled like video games from the safety of Nevada, continue to target insurgent strongholds near the border with Afghanistan but, as always, the collateral damage is steep. Hence the reason miners got higher prices for their material because of the competition amongst the buyers in their mining areas. This resulted in no consequential effect on them by the economic situation the world over. Those who bought, and brought their material to market, would not sell at reasonable prices because of the high price of their own purchases. These people waited and waited with the hope of having their minerals fetch profitable prices, but in the last four months, they have started adjusting to the call of the time. And so, in turn, word of the situation is now reaching miners of the major mining areas in both countries. And the miners would do well to listen because their buyers actually (in most cases) pay them in installments and when installments stop or lessen, that’s a solid signal to miners to re-think their prices. Also now miners suspect their buyers are not buying each and every item, but only best or finer ones, and thus their attitude has softened. The material that was brought to market last year is either lying unsold, or if has sold, must have been sold at higher prices. 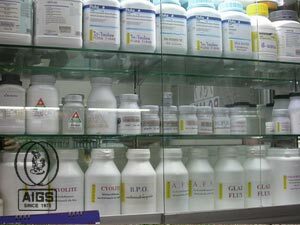 Material that has reached the market this year has commanded good prices. And so now with each day passing, there is an increasing glimmer of hope that we’ll get better items at better prices. But this is only because the effect of this economic recession has just now started gradually to be felt by everybody in the minerals and gems business here. Secretary of State Hillary Rodham Clinton remarked back in February during her Asian tour, “Clearly, the path we have taken in imposing sanctions hasn’t influenced the Burmese junta. Reaching out and trying to engage them hasn’t worked, either.” As Tim Johnston of the Washington Post commented last week, Clinton’s remarks “have triggered an intense debate about what approach toward Burma … might prove more effective.” Sen. Jim Webb, who heads the Foreign Relations Committee, seems to be ready for a change, too. Indeed, somehow the void created by sanctions in Burma appears to be being filled, as demonstrated by figures released since our last Gem News. And, as we noted March 24 on Palagems.com, Burma likely had its largest sale ever at the 46th Annual Myanma Gems Emporium, held March 8–20 in Yangon. Associated Press quoted an unnamed source as claiming jade sales alone topped $191 million. 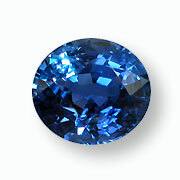 This 2.79-carat natural blue sapphire from Burma is available. It has a medium intensity, allowing its brilliance to catch the eye. Inventory #7326. An Associated Press story today quotes an unnamed source as claiming jade sales of more than $191 million at the 46th Annual Myanma Gems Emporium, held March 8–20 in Yangon. Even though sales figures for pearls and gemstones were not available, this sale appears to be the largest ever, according to our Burma Gem Sales and Statistics. “El Itoco,” “Bahia,” “El Caballito Corriendo,” and a jet-setting jade Buddha? This month’s featured stone comes to us from Brazil and is precious and imperial in many ways. When we’re talking about topaz, imperial is a descriptive term for golden orangey-yellow hues, and precious is usually reserved for the more pink-red hues. However, these terms can, and often are, used interchangeably by gem dealers. Exceptional colors like these are only found near the town of Ouro Preto within in the state of Minas Gerais in Brazil. 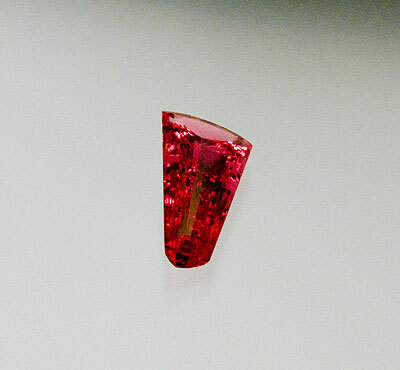 The top half of the stone exhibits the classic golden color, while the bottom seems to collect all the rich rosy pink color. This combination of color is extremely rare to find within the same stone—not to mention a flawless interior. 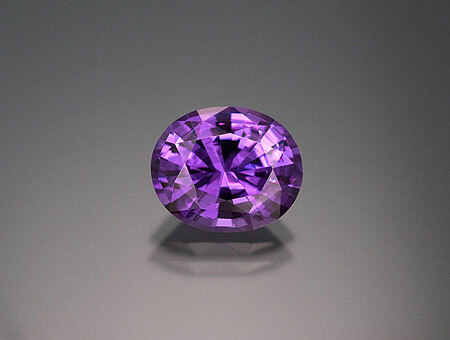 And the origin of color in this jewel is natural; the original crystal actually exhibited these two distinct hues. (Oftentimes rich imperial colors can be heated to produce the pinkish hues.) A true collector’s gem fashioned to fit nicely into a one-of-a-kind pendant. 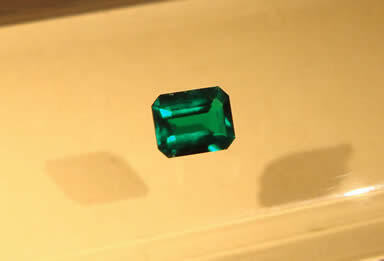 The Gemological Institute of America (GIA) announced yesterday the debut in its museum of a recently discovered 472-carat emerald crystal from Colombia’s Muzo region of the northeaster Department of Boyacá. 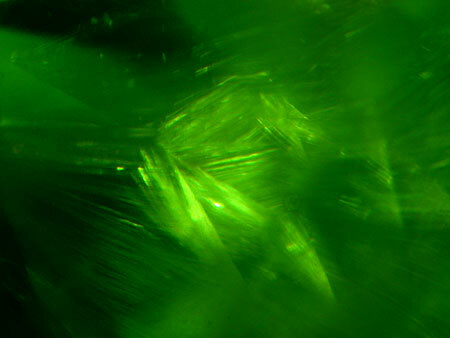 This locality has produced some of the most spectacular emeralds ever seen. The crystal is dubbed “El Itoco,” from the local Muzo native people. 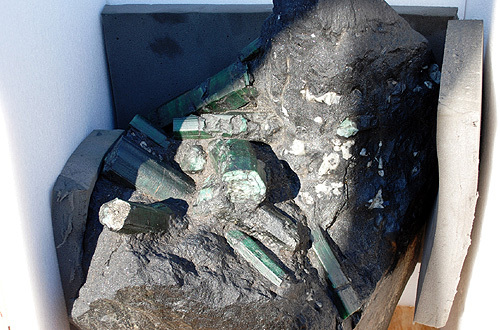 The specimen is loaned to the museum by Ron Ringsrud (who we featured in last month’s Gem News) on behalf of mine shareholder and emerald exporter Hernando Sanchez. 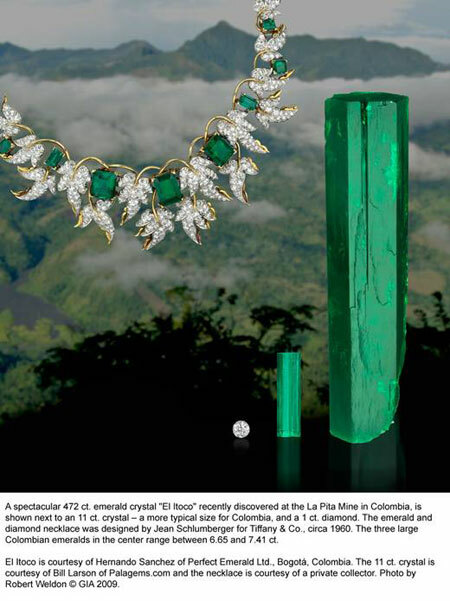 “This is the first time any of the Colombian mine owners have displayed such a significant emerald at any museum worldwide,” Ringsrud said, according to the GIA press release. 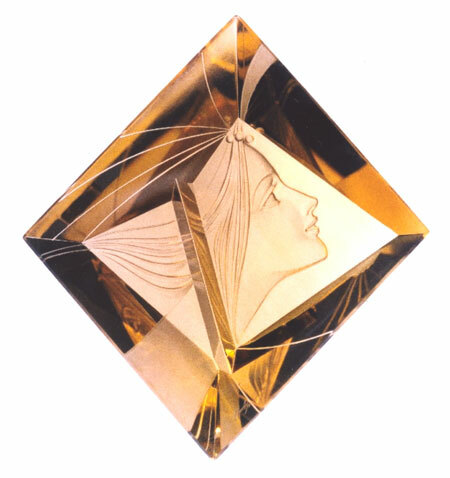 The photo (above) included with the release features an 11-carat crystal supplied by Pala’s Bill Larson. Last month we reported on the recovery of a missing 840-lb. 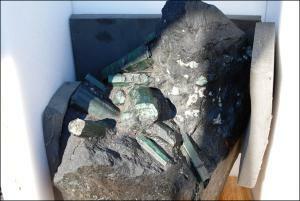 rough gemstone, the “Bahia” Emerald, featuring ”arm-sized crystals.” On March 4 we posted an update on Palagems.com in an attempt to sort out the history of the stone’s whereabouts. At Tucson this year, J. Thomas Shofner of Palmetto Gems & Gemological Services stopped by the Pala booth and chatted with Pala’s Jason Stephenson. 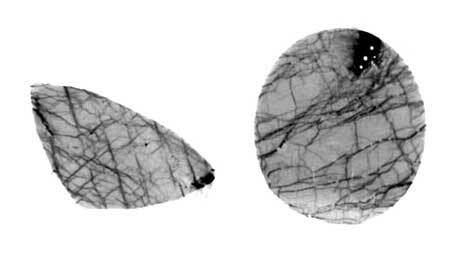 It seems that Shofner purchased a demantoid garnet from Pala at the 2003 show and took several photomicrographs to illustrate the distinctive “horsetail” inclusion seen in such stones. 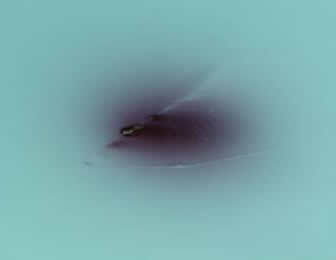 “[I]n the course of several shots, this one emerged,” Shofner told us. “I did not even see the ‘horse’ while composing the shot, only afterwards while viewing the results. 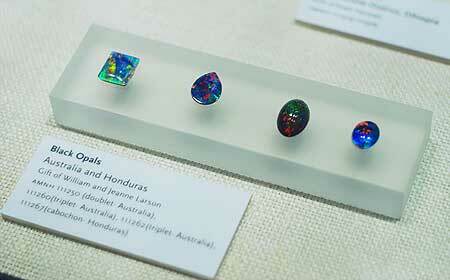 Pure luck!” Yes, and this belongs in our inclusions gallery, The Internal World of Gemstones. Billed as the world’s largest (or one of the largest, according to its sponsors) to be carved from gemstone-quality material, the “Jade Buddha for Universal Peace” began a worldwide tour—on Friday the 13th—in Da Nang, Vietnam. A copiously illustrated brochure explains that the image was carved, by Jonathan Partridge and crew, from an 18-ton boulder named “Polar Pride,” honoring its Canadian arctic provenance. The brochure quotes Fred Ward, from his book Jade: ”Without doubt, this is the largest piece of gem grade jade found in my lifetime and perhaps the millennium [it was discovered in 2000].” A Handmark Gallery newsletter states that Partridge, born in the UK, studied over 15 years with Tibetan and Bhutanese masters in India before relocating to Tasmania in 2004. The image is modeled after that in the Mahabodhi Temple in Bodh Gaya, India, and thus assumes a “adamantine” posture (legs crossed, soles of feet facing up; from the Greek adamas, “invincible,” later “diamond”). 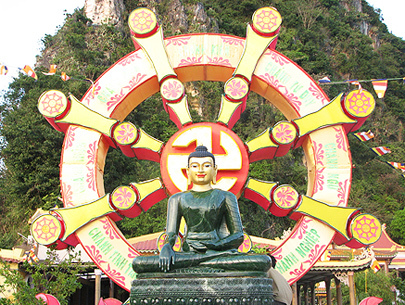 The hand gesture is the Bhumisparsa mudra—touching the earth—a reminder of the moment when the prince Siddhartha attained his enlightenment: calling upon the earth to witness his resolve not to be distracted from his dharma, or path. On the first anniversary of his death, Grahame Brown’s beloved The Australian Gemmologist has published reminiscences and selected papers by Australian authors. The issue also includes a list of the late editor’s own published works, which according to his obituary in JCKonline, topped 500. 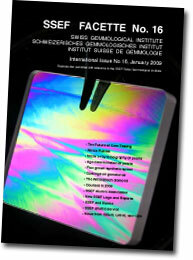 The tribute issue includes a study titled “Sapphire–Ruby Characteristics West Pailin, Cambodia: Clues to Their Origin Based on Trace Element and O Isotope Analysis.” These analyses “confirm a clear distinction between magmatic origin sapphires … and metamorphic-origin sapphires and rubies,” according to the abstract. Comparison with comparable Australian material also demonstrated similarities and differences. Blue for you. Rough sapphire from Pailin, Cambodia, February 2009. Photo: Richard W. Hughes. See more photos from this Pailin trip at Ruby-Sapphire.com. 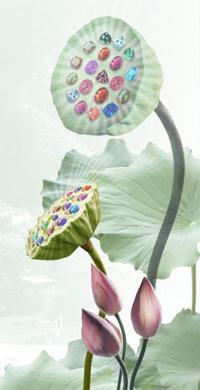 Last month we looked at the tanking colored gemstone market in Thailand, and efforts to revive it. This month, the Bangkok Post reports (as posted on BurmaNet) that the market in Mae Sot is “teeming with Thais and foreigners shopping for gemstones.” An annual gems fair was held this year, February 27 through March 1—a collaboration of local government, commercial, and industrial concerns. Traders in Mae Sot’s Rim Moei market, near a cross-border bridge, noted that efforts like the gems fair are needed for a local trade that has been woefully quiet. Mae Sot, on Thailand’s western border with Burma, has had an influx of traders who, according to the article, have been abandoning Chanthaburi due to the closing of factories there, as we mentioned last month. Trade in border and other gemstone centers such as Mae Sot has been closely linked to legal and not-so-legal trade with Burma. A fistful of dollars. 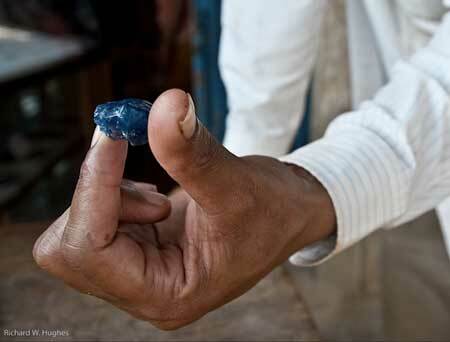 A sapphire miner at Chanthaburi’s Khao Ploi Waen holds a day’s production. The mine closed just days after Richard W. Hughes took this photo earlier this year. See more photos from this Chanthaburi trip at Ruby-Sapphire.com. BBC reported yesterday that orders for stones from Burma have “almost come to a halt” and prices for them have “plummeted.” The story quoted a gem trader as saying that the price for a viss (~1.63 kg.) of jade rough had commanded just over £100; now it’s about £10. 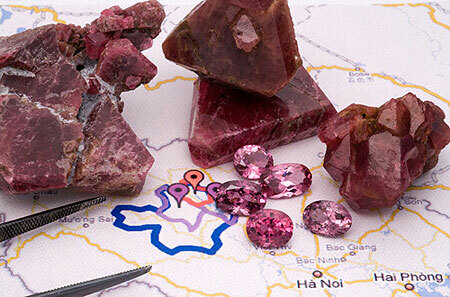 Predictably, the U.S. ban on Burma ruby is cited for the collapse of the market. Others, the BBC report continued, have questioned this assumption, pointing to the fact that “most Burmese gems end up in Europe,” so the sanctions cannot solely be blamed. 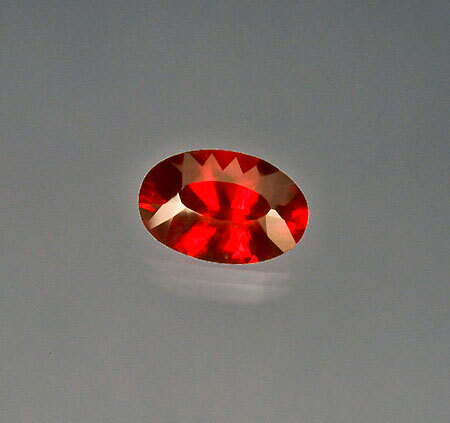 Red spinel from Burma. 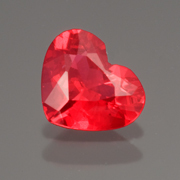 This 1.34-carat heart-shaped stone is highly fluorescent. Search on Inventory #11963. 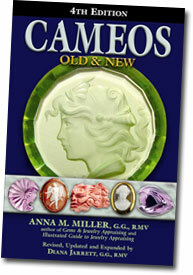 The 4th edition of Cameos Old & New, by Anna M. Miller, has been revised, updated, and expanded by Diana Jarrett. It’s a current encyclopedia on cameos including: history, mythology, production, materials, appraisals, collecting, artistry, and the future of cameos. This is a must-have for anyone involved along the path cameos take, from start to finish, into the market place, and beyond. The book contains 371 pages of insightful information, detailed pictures, and 16 color plates. The book is then concluded with a chronology of engraved stones and cameos in Europe, along with a glossary of glyptic-art and jewelry terms. 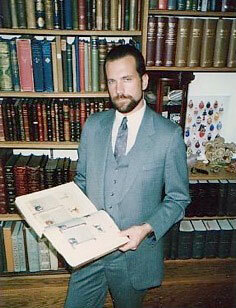 The book is widely available, including from the publisher, Gemstone Press. Joseph O. Gill’s Historical Index to Gems and Jewelry Online, which we profiled last month, has been updated as of March 8. The book, in Microsoft Word 2007 format, is available for free download from the Internet Archive. Congress 2009 of the International Colored Gemstone Association will be held just 75 miles northwest of Hong Kong, in the port city of Guangzhou (Canton), at the mouth of the Pearl River. Industry leaders from around the world will exchange trade updates and views through presentations and discussion sessions designed to encourage lively debate and networking. The ICA Congress is expected to draw the largest number of attendees to date. Exciting excursions and activities complete the full schedule of networking events. On your way to the ICA Congress, stop in Istanbul for CIBJO, the World Jewellery Confederation, Congress 2009. The fact that Turkey is hosting the event is very significant. Like no other market, the country represents a blend of East and West, and it has helped unlock the fast developing markets in the republics of the former Soviet Union, as well as in the Middle East. Turkey also represents a strong jewellery market in its own right, and it is an economical jewellery design and manufacturing centre within just a few hours flying time from Western Europe. It is exactly the type of the centre that we need to look to in difficult times such as these,"
One fun and curious aspect of the Tucson show is the chance to roll the dice and buy rough crystals of various colored stones in hopes that they will morph into beautiful gems. Evaluating the rough and trying to imagine what the finished stone will look like can be enjoyable. There’s always a gamble when buying rough gem material, but the payout can be surprising and rewarding. This month we feature a few jewels that came from the rough and into the light as happy, newborn jewels. 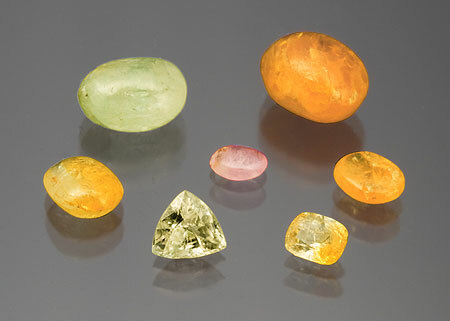 A 36.67-carat large oval greenish-yellow apatite from Mexico, a 7.57-carat elongated cushion umbalite garnet from Tanzania, a 1.91-carat small cushion pinkish red spinel from Tanzania, a 2.80-carat trilliant chrome tourmaline from Tanzania, and a 6.42-carat cushion rubellite tourmaline from Nigeria. 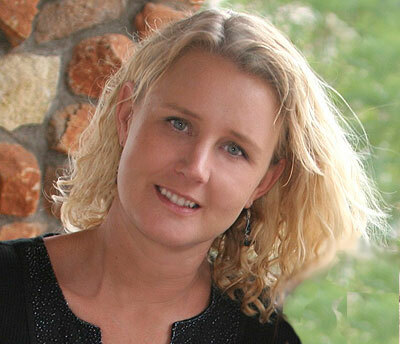 Mia Dixon first started at Pala International back in 2002 as the Administrative Assistant. She left the company in July of 2004 to raise her first child. Longtime readers of Pala International’s Gem News will be familiar with the work of Bud Standley. Standley’s carved chrysocollas were our featured items for April 2006. 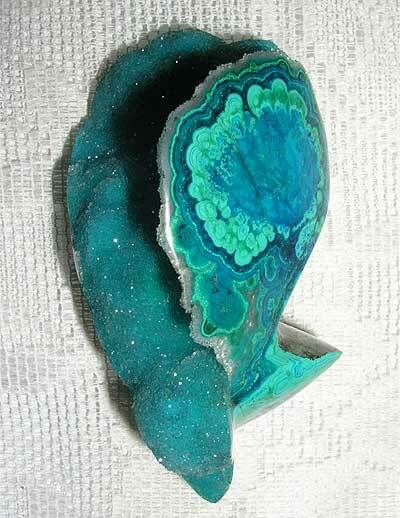 Beginning his career with turquoise, Standley was one of the first artists to move on to azurite and chrysocolla. Prominent emerald dealer and fair-trade advocate Ronald Ringsrud has been trying to clear the muddy waters surrounding the phenomenon of gota de aceite—literally “drop of oil”—the subtle roiling or “butterfly wing” effect unique to rare Colombian emeralds. His most recent prominent discussion of the phenomenon is found in the Fall 2008 Gems & Gemology (much G&G content is now archived online). “Only among connoisseurs is this effect known; it is misunderstood more than understood,” Ringsrud writes earlier, in Rivista Gemmologica Italiana. 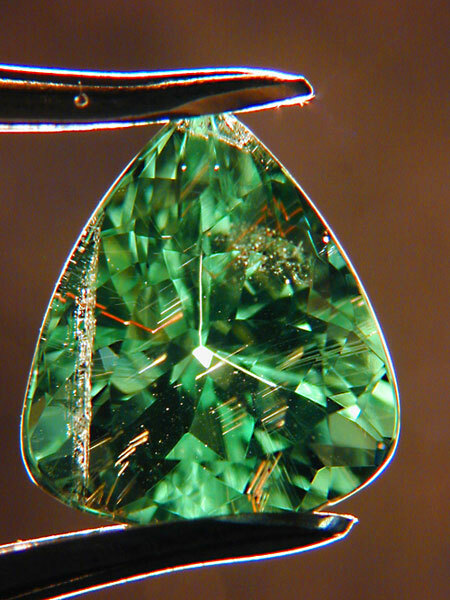 While the cognoscenti (couldn’t resist…) appreciate gota de aceite in emerald as a special quality (compare with the velvety Kashmir sapphire), Ringsrud protests its hasty application in Europe and the U.S. “to any fine emerald; even if the emerald does not have this effect.” He estimates its occurrence to be limited to only one in a thousand to two thousand Colombian emeralds. 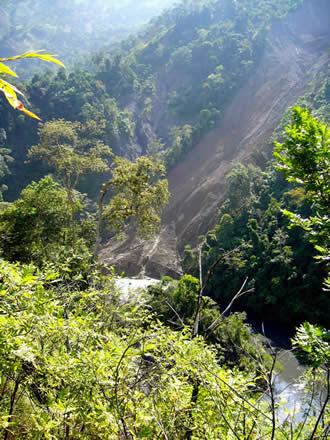 A mudslide near the entrance to the La Pita emerald mine, in the northern Colombian department of Boyacá, killed a mining employee and a construction worker, according to Ron Ringsrud. 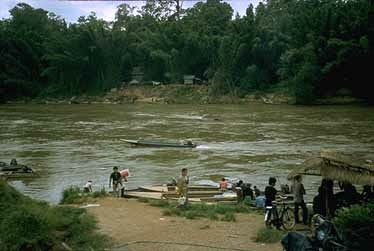 The Minero River became a lake for over two hours in early January, raising the water level, and threatening the emerald mine entrance. See Ringsrud’s website for “before and after” photos of the site. In late December, the Los Angeles Sheriff’s Department announced it had recovered the “Bahia” Emerald, an 840-pound specimen that is the center of confusion and litigation. According to a December 26, 2008 Los Angeles Times story, the specimen was stolen in September from a vault in South El Monte, finally being located in Las Vegas. 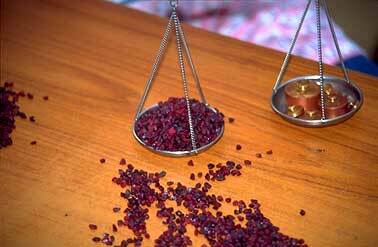 In September, we pointed to much information regarding rubies from Winza, Tanzania. 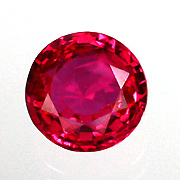 In December, we featured rubies from Winza as that month’s special gemstone offer. This month we’re pleased to point to Vincent Pardieu’s extensive account of the expeditions he led last spring to Winza, in central Tanzania. Copiously illustrated, as usual (with video and inclusions as well), the visits, in part, led to the publication of a 25-page article, published in the Winter 2008 edition of Gems & Gemology. 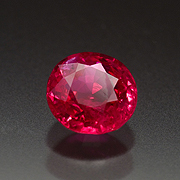 “Rubies and Sapphires from Winza, Central Tanzania” was co-authored by an international group of ten gemologists and scientists. The article includes discussion of the distinctive inclusions and color zones unique to the material from Winza. 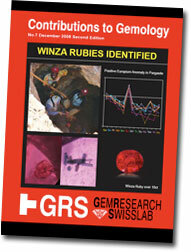 Just before Tucson, Dr. Adolf Peretti, Director of GemResearch Swisslab (GRS), notified us about the lab’s publication of a 100-page hardcover book on Winza ruby. 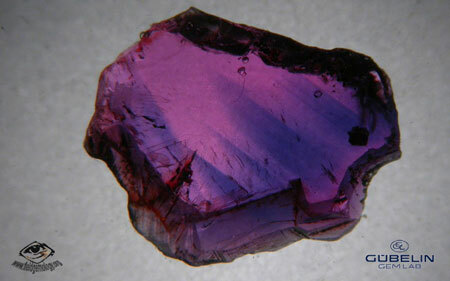 Winza Rubies Identified is No. 7 in GRS’s Contributions to Gemology series. A PDF of the book’s table of contents is posted on the GRS website. GIA Laboratory staff members determined that the phenomenon is produced by fluid containing naturally occurring radioactive material. 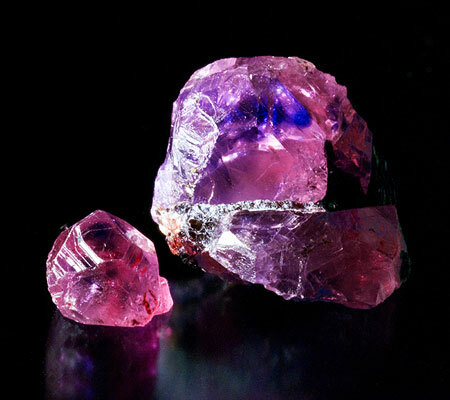 The presence of such pink zones, according to the report, is evidence that the material has not been heat-treated, and also is an indication of locality: Mozambique. Above: When these tubes are viewed near-parallel to their length, a pink zone can be observed immediately surrounding the tube. 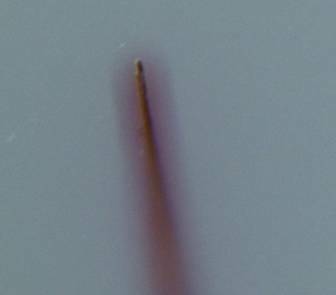 The growth tube is 0.06 mm in diameter. Things may be slow in the gem trade—AGTA reported that this month’s GemFair attendance was down by 19%—but wealthier clients are swapping soft-market assets for the hard stuff, according to a February 2 story from National Jeweler. The article includes examples of jewelers who are seeing booming business transactions with eager investment buyers—and “hoarders”—during a dismal holiday shopping season when “Black Friday” gained new and unfortunate meaning. One Southern California dealer claims that, unlike during the 1987 stock market mm… correction, gems and jewelry are seen as an investment option worthy of consideration. The story also highlights the in-the-pocket portability of jewels—compared with, say, real estate—for jet-setting, euro-dropping shoppers. This is nothing new, but the Bangkok Post ran a story on February 18 discussing the sad state of the Thai colored gemstone market. Chirakitti Tang, president of the Thai Diamond Manufacturers Assoc., said prices for such stones as ruby and sapphire already are so low they aren’t apt to go lower. He reaffirmed what we’ve been hearing: 80% of Chanthaburi factories have closed down over the past six years. He blamed the reputation that Thai stones have obtained over the last decade due to undisclosed enhancements. He suggested that the government partner with the private sector in order to develop a disclosure strategy that will satisfy the wary buyer. 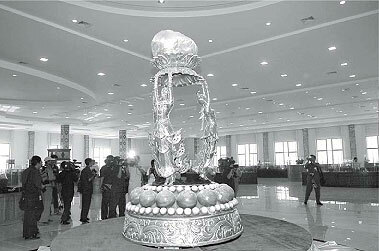 The Gems Museum (Nay Pyi Taw) of Myanma Gems Enterprise opened February 12 in the administrative capital, according to the official New Light of Myanmar daily. the 6.2 centimetres long and 3 centimetres high world’s largest natural pearl weighing 45.06 mommes (845 carats or 929.50 rati) decorated with three female celestial beings, the most valuable Myanma cultured pearl weighing 9.8 mommes (104.39 carats), the valuable Myanma jade stone weighing 69 kilos, the Myanmar orchestra and ornaments made of jade, the largest Myanma ruby weighing 21,450 carats, and other ornaments made of ruby, quartz, Myanmar gold and silver wares and jewellery and uncut Mogok gem stones, various uncut gem stones and granite stones. 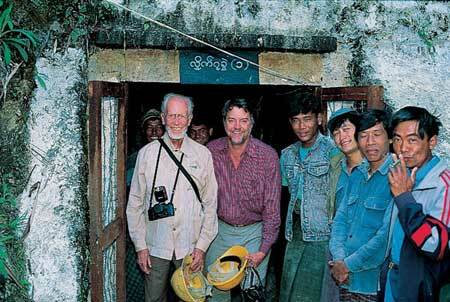 This photo, taken by well-traveled gemologist and dealer Olivier Galibert is included in a 20th century account of a rainy season adventure in Burma’s Phakant area of Kachin State. For those bored by the conventionality of the World’s Largest Natural Pearl, slap on your gumboots because the roads leading to Phakant (aka Hpakan, Hpakant, Phakan) are open again for intrepid gemologists. Tour companies reported that visas will be granted to the jade producing area that had been off-limits since last February, according to the foreign-language news outlet 7-Day News, by way of Xinhua News Agency. A January 28 Mizzima News story discusses the slowdown in Burma’s mining sector trade with China. One miner interviewed said he had reduced production. 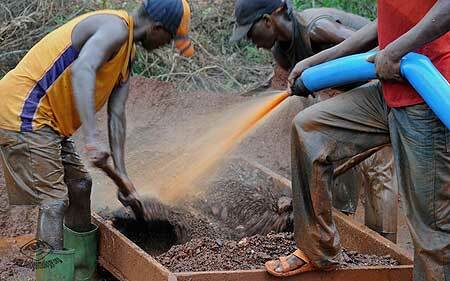 Miners in commodity minerals have shifted to maintenance mode. 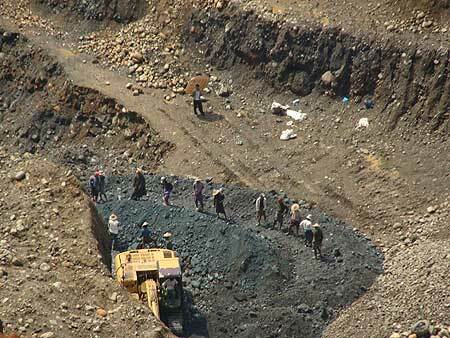 Some small mine operations may be forced to sell. China’s economy slowed to a 6.8% increase in the fourth quarter of 2008 and was only 9% for the year, the first single-digit increase since 2003, according to the official People’s Daily. On February 19, The Irrawaddy relayed a report by a Mogok gem trader that at least 50 mines in the area have slowed down production, with some closing down altogether in the wake of U.S. sanctions. Skittish from the soft market, investors are loath to shell out the money needed for fueling heavy equipment used in the mining. Traders from other countries, including Thailand and China, are becoming more scarce, according to the story. A Burmese journalist speculated that the government gemstone auctions—the next one is scheduled March 8–20—could be suspended if Chinese fail to attend. The issues of sanctions, their effectiveness, and collateral damage was the subject of International Colored Gemstone Association (ICA) meetings held in Dubai in October. See the online version of ICA’s Winter 08/09 InColor (pp. 10–11) for a report on the discussions. The same Irrawaddy story includes a claim by Yangon jewelers that buying in the city by international traders is down by 50%, just as prices have been halved as well. Because official Burma production statistics are released about 70 days after a given month’s end, we won’t know the figures for December and January for some time. The figures for the three months ending November 2008, released February 6, show a general downward trend in overall production, but look at the figures for sapphire and jade. As we constantly studied the ruby and sapphire mines in Mogok, it was only a matter of time to discover one of the rarest collector gems in the world: Johachidolite. It is a true gem with its vivid color, high brilliancy due to the high refractive index, high density and Mohs hardness of over 7.5. 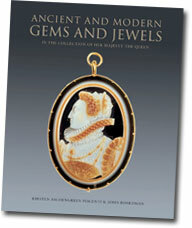 Joseph O. Gill is offering a newly revised edition of his classic Gill’s Index to Journals, Articles and Books Relating to Gems and Jewelry. For free. And in an easily searchable digital format. 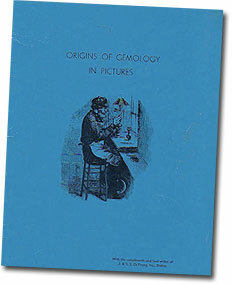 Originally published in 1979, Gill’s “analog” database was only the second book published by the Gemological Institute of America that was not written by a GIA staff member, according to a lively scrapbook/biography offered as “Appendix 1” to the new digital version. Both Gill’s Index and Appendix are available for free download via Internet Archive (host of the famous Project Gutenberg). And, of course, the publication of his magnum opus, the product of nine years of compilation on 48 inches’ worth of 5"x8" index cards—about 4,500 by our estimation. Typing the book’s draft alone took eighteen months. So you can look up France and find that a rough diamond was found there or what gems were found in Antarctica or California or Nigeria or Ghana or Florida or in the oceans or anywhere including from outer space. You can find all the references ever in English from the first book done by Thomas Nicols on gems in 1652 until 2008, near 350 years of all the publication in English on gems along with more than 18 journals on gems and minerals. I went through each sentence of each publication and all was put in this handwritten annotated index. 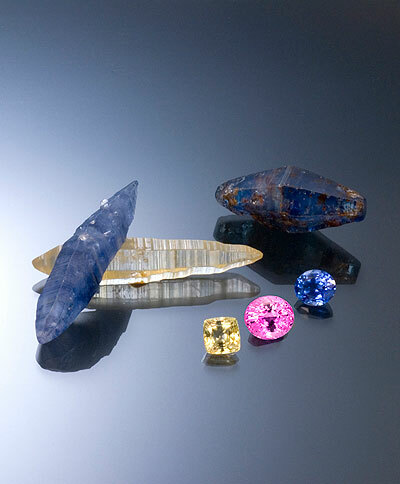 This presentation will make a great companion piece to Jason Stephenson’s “Collecting and Investing in World Class Gemstones” featured in last month’s issue of Pala’s Gem News. Acclaimed photographer Robert Weldon will present “A Photo-Safari to Gemstones of the World” this Thursday at 7:00 p.m. at the Sheraton Carlsbad. The seminar is cosponsored by the San Diego chapter of the Women’s Jewelry Association (WJA) and the Gemological Institute of America (GIA) Alumni Association. The Seminar will provide an overview of gem supplies as well as which gems will be popular at the upcoming Tucson trade shows in February. Weldon will also share his experiences and photographs from visiting different and far-reaching gemstone localities around the world. Weldon is Manager, Photography & Visual Communications, GIA. The seminar is open to the public. Pala International obtained a parcel of rough rhodochrosite at November’s West Coast Gem & Mineral Show in Costa Mesa, from a locality that has yet to be confirmed. We will keep you posted as the mystery of origin unfolds. The material is the classic, beautiful pinkish-red hue, with more peach or orange secondary than some of the other rhodochrosite localities. 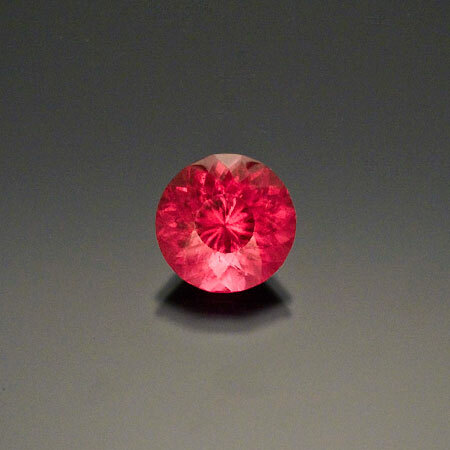 Reminiscent of a padparadscha sapphire, with a pleasing blend of colors and a fluorescent glow. There are several localities around the world that produce rhodochrosite mineral specimens but there are really only two that produce facetable rough in quantity and quality: the Kalahari manganese fields of South Africa, and the Alma District of Park County in Colorado. Displaying these three examples, you can see the unique variations of red produced by each deposit. Production from South Africa and Colorado is extremely limited; however, the new material is available now. We received the following note from Dr. Michael Krzemnicki, Deputy Director and Director of Education of SSEF Swiss Gemmological Institute, in response to last month’s discussion of red feldspar nomenclature by John S. White. Interesting and very correct remark by John S. White: The intense red and green feldspars which I analysed in 2004 were also labradorites and not andesine. Photo courtesy Maine State Museum. Maine’s first lady Karen Baldacci will attend presidential inaugural events adorned with the Maine Tourmaline Necklace, which contains 52 carats of pink, green, and blue-green tourmaline from the Dunton quarry in Newry. The necklace features gold panned from the Swift River in Oxford County as well as a dangling 24-carat pink tourmaline centerpiece. 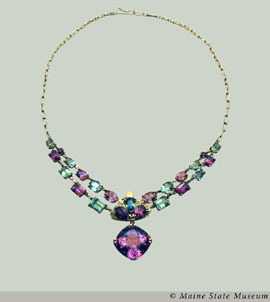 The necklace was presented to the state in 1977 with the provision that Maine’s first ladies would wear it on official state occasions. Last month we noted that jade markets in China had stagnated, due apparently to the U.S. ban on Burma jade. Burma’s Ministry of Mines announced the allocation of six gem mining blocks to local entrepreneurs with ties to the country’s rulers, according to a January 14 story by Mizzima News (MN). The blocks are located in Shan and Kachin states, and Sagaing division in the north and eastern regions of the country. [s]oon after China's Beijing Olympic Games in August, the Ministry of Mines under of the Burmese ruling junta created more than 400 new jade mining blocks in Hpakant, Lonkin (Lawng Hkang) and Taw Maw, according to ethnic Kachin jade merchants in Hpakant. While operation of jade blocks is granted only by approval of ruling authorities, and then mainly to “private” companies allied with the rulers, the KNG story explains an alternative jade mining system, Naing-ngan-daw Akyoto, or “mutual benefit” (as in benefit between company and authorities). Begun in 2005 in Phakant, the system offers block operation for a small mining permission fee and a 40-percent tax for each sale. The MN story mentions changes seen in the local gem markets of Mogok and Phakant. With the advance of mechanized mining, controlled by select enterprises, the finest rubies and jade now bypass the local traders, moving across borders or to official auctions. The article quotes a “long time jade businessman in Mandalay” as saying that the country’s rulers are earning more from cross-border trade than from auctions, the latest of which was held earlier this month. The November 24 KNG article claimed that jade mining in Phakant (aka Hpakant) resumed in October, after a break in the monsoons, as if the world economic crisis and U.S. sanctions hadn’t occurred in the meantime. Gemstone material is declining in quality and quantity, according to an unnamed “retired professor from the Rangoon Institute of Economics” quoted in Mizzima News on January 11. 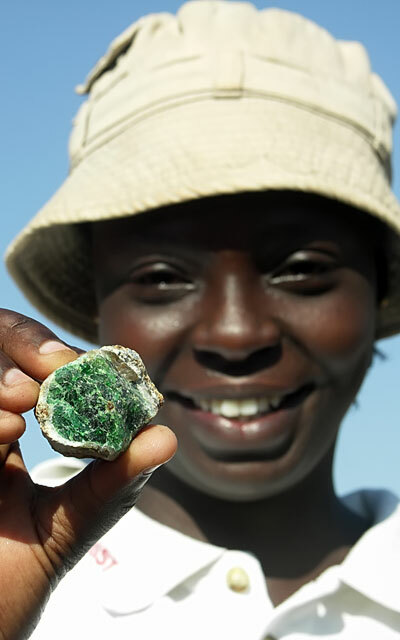 To illustrate the point, the article compares FY2007–08 production with 2004–05 (ruby) and 2003–04 (sapphire), which are down considerably, but as we reported last month, production of jade, ruby, and sapphire is up by at least a third for the first nine calendar months of 2008. At present jade markets are cold in China and with [the] U.S. ban on importing gem[s] from Burma, most small jade companies have stopped mining but only some jade companies linked with drug smuggling can continue mining, said sources close to jade companies in Hpakant. Mizzima News: Gems tycoon Zaw Zaw has assets frozen by U.S. The Royal Collection Publications, an arm of the trust that oversees the treasures of the British royal family, is publishing a monograph devoted to the gemstones in the collection of reigning monarch, Elizabeth II. The Royal Collection includes historic gems and jewels of outstanding quality. 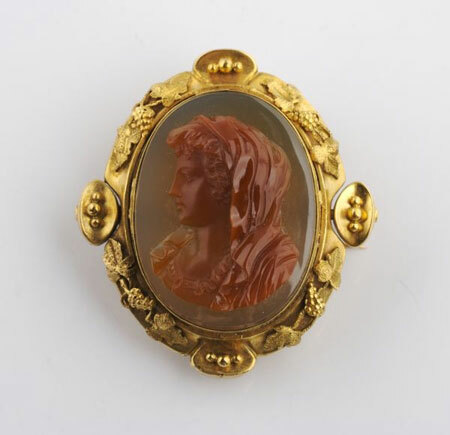 The Claudius cameo, the Darnley jewel, the “Henry VIII” hat badge and the group of sixteenth- and seventeenth-century cameos and intaglios are as fine as any to be found in the royal and princely collections of Europe. A unique combination of chance and royal taste has given this important part of the Royal Collection its particular character. The 327 cameos, intaglios, jewels and signed Orders cover over 2,000 years of jewelry history and clearly reflect the differing tastes of their previous owners. 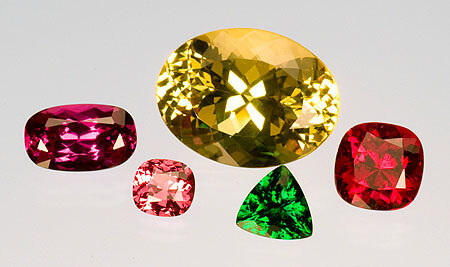 Extensive research in contemporary account books and inventories has produced much new information on the history of individual gems and jewels. This major catalog brings together the conclusions of two leading historians and offers not only a visual record of the appearance of every piece, but also an insight into the delicate art of hardstone carving. 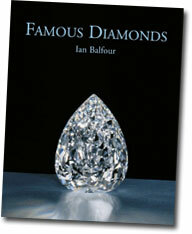 Also from the Antique Collectors’ Club, what appears to be the fifth edition of Ian Balfour’s Famous Diamonds. Balfour, who spent decades in the diamond industry, takes the reader through the stories and histories behind nearly 80 world-class diamonds, and forty more notable stones. The book includes over 200 photographs.